Severe nausea and vomiting, recurrent dehydration, and malnutrition occur infrequently after gastric bypass. A small number of patients, though, will present with refractory symptoms requiring multiple hospitalizations and intravenous or enteral nutrition. Enteral access routes have previously included either a nasojejunal feeding tube or gastrostomy tube placement in the gastric remnant. 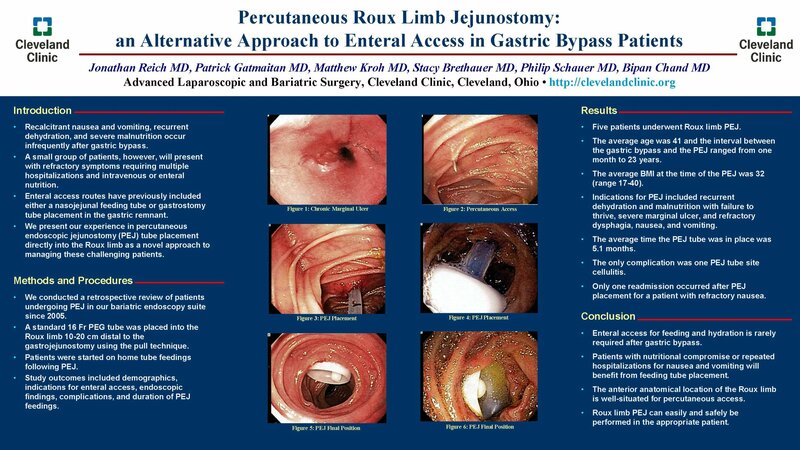 We present our experience with percutaneous endoscopic jejunostomy (PEJ) tube placement directly into the Roux limb as a novel approach to managing these challenging patients. We conducted a retrospective review of patients undergoing PEJ in our bariatric endoscopy suite since 2005. A standard 16 Fr PEG tube was placed into the Roux limb 10-20 cm distal to the gastrojejunostomy using the pull technique. Patients were started on home tube feedings following PEJ. Study outcomes included demographics, indications for enteral access, endoscopic findings, complications, and duration of PEJ feedings. Five patients underwent Roux limb PEJ. The average age was 41 and the interval between gastric bypass and PEJ ranged from one month to 23 years. The average BMI at the time of PEJ was 32 (range 17-40). Indications for PEJ included recurrent dehydration and malnutrition with failure to thrive, severe marginal ulcer, and refractory dysphagia, nausea, and vomiting. The average time the PEJ tube was in place was 5.1 months. The only complication was one PEJ tube site cellulitis. There was only one readmission after PEJ placement in a patient with refractory nausea. Enteral access for feeding and hydration is rarely required after gastric bypass. Patients with nutritional compromise or repeated hospitalizations for nausea and vomiting will benefit from feeding tube placement. The anterior anatomical location of the Roux limb is well-suited for percutaneous access. Roux limb PEJ can be easily and safely performed in the appropriate patient.